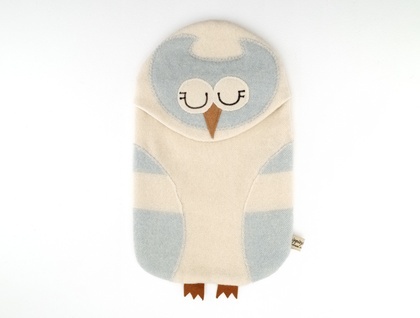 A cute but practical Hot water bottle cover( which also doubles as a P.j. case), made from a thick vintage 100% NZ wool blanket, handmade in NZ. This listing is for a vintage powder blue and cream Owl hottie cover, I often also have these in vintage peachy pink/cream or vintage tiffany green/cream, please enquire if you would like a different colourway. A shy sleepy owl Hottie Cover made from vintage 100% Wool blanket to my own original design. 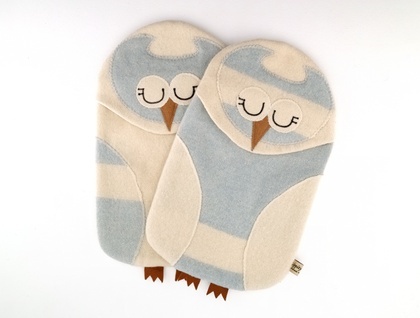 Features blanket stitching details around wings and face for extra homemade feel good craftyness. Currently available in vintage peachy pink with cream or vintage baby blue with cream. Please specify your colour choice when sending through your delivery details, thanks. I have more than one availlable, each one is individually made and slightly different and the stripe placement may vary a little on each cover, but rest assured I do make sure each one is equally cute! Please enquire for different colour availability.